No self-respecting shopper in Órgiva would want to be seen without a trolley. Like the town’s bars, dogs and PA announcements about forthcoming fiestas, you can’t escape them. It’s usually women at the helm but we’ve spotted men guiding them through the streets. And, as if stumbling upon a funeral cortège, ordinary people stop to make way for the canvas cavalcade. A strange phenomenon is that 80-90% of trolleys HAVE NOTHING IN THEM. Even late on market day you could probably pick one up with your teeth. They must act like Linus’s blanket; a comforting extension to one’s arm. We’ve since done a survey about them. If it were, say, New York, passers-by, annoyed by the assault on their ‘personal space’ would kick out at them. In London, workers rushing for an Underground train would be sent flying by the larger-than-it-looks back resting bar, despite being bright and as gay as your hat. There may be a club for trolley-spotting too. If so, come to Órgiva and you’d never leave (in Lanjarón you’d die counting). Most trollies are made by Rolser – their headquarters are in Alicante. In the UK they retail for between £40 and £100. There was even a blog devoted to them – although the writer seems to have packed their bags (last updated in 2008). 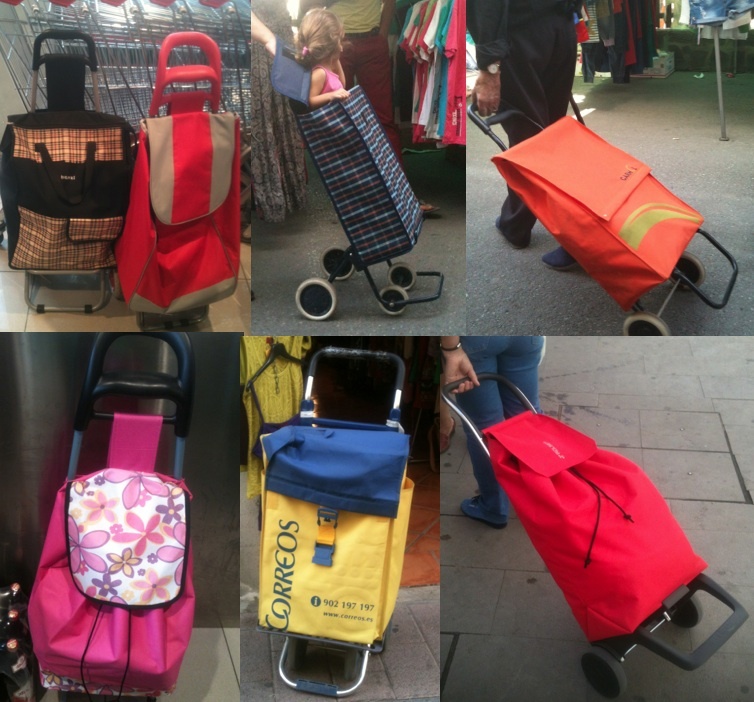 A trolley is money well spent, even if only to transport air – and the occasional child. Seen an extraordinary-looking trolley? Even one overflowing with goods? Or do you own one? Send us your pictures. You’ve been brainwashed into not seeing them. There’s a yellow one next to you right now.